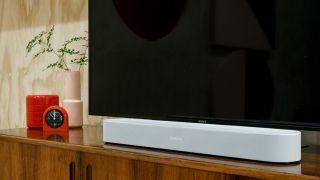 Save up to £50 on Sonos Beam, Playbar and Playbase | What Hi-Fi? Everyone loves a Sonos deal and right now that includes a whole host of UK retailers. You can save on all the Sonos TV speakers, with money off the Beam, Playbar and Playbase. To get in on the act, you do need to make a not inconsiderable purchase: a new TV or, at some retailers, a new projector. Buy the compact Sonos Beam speaker with any TV/projector and you can get a £30 discount; buy a Sonos Playbar with a new TV/projector and you can save £50; while a Sonos Playbase purchased with a new TV/projector will also see you make a £50 saving.